1. Can you tell us a little bit about your background? MBA from NYU, CPA. Primary work experience at PWC, Citi and AllianceBernstein. 2. What made you decide to go into risk management? I spent a lot of time on John Reed’s staff. Roger Kline, a former partner of McKinsey said that Henry (John’s Chief of Staff) and David used to go in and see John. Henry would talk to John and then David would come out and “give over” what was said. One day, John asked Henry and I to prepare a risk management report for the Board. He said this is how he was going to manage risk going forward. I morphed that report into the first ever enterprise risk management system and I found my calling. 3. Can you describe a little bit about the book you just wrote? Risk and the Smart Investor is all about how to make better decisions. I did not want to be prescriptive but rather create a framework for people to use. 4. Who would benefit the most from reading your book; regular Americans, individual investors, risk managers at institutions, regulators etc? My first book proposed was rejected by McGraw Hill. They wanted me to write a book for professional risk managers, my natural audience. If you ever watch a professional athlete, they make it look so easy. I wanted to make the thought process associated with risk management easily accessible to all. 5. Do you find measurements like Beta and alpha useful at all? Statistical measurements are useful as one input into making a decision. I always try to obtain as many data points as possible and then apply judgment to make a decision. The problem occurs when we think one statistical measure tells us everything we need to know. 6. If the previous measurements of risk which were based on the efficient market theory have been proven to be largely false what measurements should institutions and investors be using? I think it was Disreali who said, there are lies, damn lies and then there is statistics. Measurement is good, the question is how you interpret the answers. 7. On a similar note is there any scientific or mathematical way of measuring risk? There is a notion out there that you cannot measure risk. Robert McNamara first started talking about known unknowns and unknown unknowns. In other words, there is stuff out there that you know about that can derail you but it is not measureable and then there are things out there that can derail you that are totally unknown. While I agree there always is some uncertainty that is not measureable, I think the process of thinking about risk, creating some defined boundaries you can live within and having at least an exit strategy is important. 8. Would you define risk differently for long term versus short term investors? There is nothing wrong with risk as long as it is managed. Time horizons have huge impact on returns which impacts how you manage risk. So I would define short and long term risk relative to returns, your appetite and your reasoned objectives. 9. Would you define risk differently for individual investors versus institutions? Risk management is a process. It’s not a brilliant idea or sudden revelation. 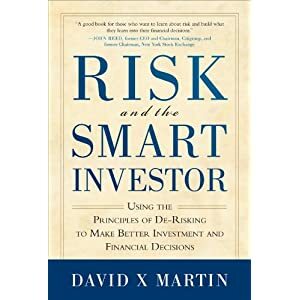 The same process that an institution uses can be adapted by an individual which is the whole point of “Risk and the Smart Investor”. 10. How much did the current risk models used by large institutions contribute to the financial crisis? History is “his story”. Even though it is supposed to represent what happens in the real world, it is biased by who is telling the story. Models are also supposed to reflect the real world and are also biased by the people who build them. It is hard to get history right which deals with past events. It is even harder to predict the future based on the past. Whenever a defining event happens, there are always multiple failures. Models were a factor in the financial crisis, but one of many. 11. Have large institutions changed their risk models at all due to the financial meltdown? Risk models have been changed to reflect the financial crisis experience. There is a greater focus on current data points, counterparty risk and liquidity. 12. You are an expert on risk and hold an important position at a very large financial institution; has anyone in Congress, the SEC or any other branch of Government asked for your input? 13. If you had a recommendation for congress in terms of financial reform what would it be? My recommendation would be to spend some time thinking about the causes for the next crisis. Take for example cyber warfare. What would happen if a financial institution could not identify the recipients of its payments? 14. Do you plan to write another book? I just finished the outline and I am working on the first chapter of my next book. 15. What would the topic be about? My wife, who is very smart, was reading a recent book on the financial crisis. I asked her if she really understood the implications of what happened and she said, no. I then asked a medical doctor and he had the same answer. So I would like to focus on the financial crisis in terms of lessons learned for individuals.16. Is risk any different in the US as opposed to the rest of the globe due to regulations or cultural differences for example? Risk is not different. How it is defined and managed is different around the world and it is gradually becoming more harmonized. 17. Do you see yourself becoming more of an author/ thinker about risk, or do you plan to focus more on your day to day activities? I have always been a thoughtful person and have spent a great deal of time in professional risk management circles. I have published many professional articles, spoken at numerous conferences, co-chaired a group of Chief Risk Officers and was the founding Chair of the Investment Company Institute’s Risk Committee. I also started teaching an advanced course on risk at NYU Graduate School of Business. What’s new for me is having a public platform and the focus on individual investors. 18. What you like to become a leading thinker on risk similar to how Nassim Taleb sees himself currently? I have no idea how Nassim Taleb sees himself. 19. Can you tell us a little bit about your blog? Blogging is a new experience for me. I read a lot and I try to post materials that I think are important or thought provoking. I do not feel compelled to post something every day. 20. How do you find the time to keep a blog while having such a busy role at your job? I think clear writing reflects clear thinking and I never stop thinking.